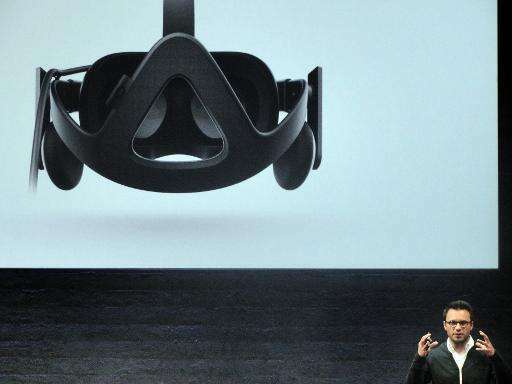 Facebook-owned virtual reality firm Oculus aimed squarely at video game lovers on Thursday as it unveiled Rift headsets that it will begin selling early next year. Oculus showed off Rift along with a dazzling array of games promised to be ready at launch, the exact date of which was not disclosed. "In virtual reality, you are going to find yourself reminding your brain that this is not real," Oculus chief executive Brendan Iribe said during a media event at a studio space in San Francisco. "It is a paradigm change." Oculus did not disclose pricing for Rift, which will come with an Xbox controller due to an alliance with console maker Microsoft. "The opportunity for us to bring our wireless controller to every Oculus user at launch is incredibly exciting for us," Xbox division leader Phil Spencer said at the event. "We believe we will be able to create state-of-the-art virtual reality experiences on the Oculus on top of Windows (computer operating system)." Combining Xbox controllers with Oculus is a win for Microsoft and Oculus, according to Gartner analyst Brian Blau. The alliance raises the potential for Oculus virtual reality gear to synch with Xbox consoles as well as across the range of devices that will be powered by Windows 10 computer operating software set for release later this year, the analyst said. Spencer said that virtual reality "experiences" would be built on top of Windows, but didn't go into details. No mention was made of whether Oculus would work with Xbox console games. "I think this does more for Microsoft and PC (personal computer) games than anything they have done in years, in terms of exciting new things," Blau said. Microsoft has promised that applications written to work on Windows 10 machines will be at home on Xbox consoles. 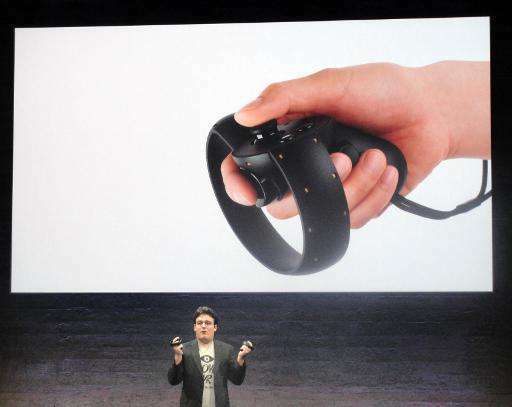 Oculus founder Palmer Luckey also showed off a "Touch" accessory that will let people essentially reach into virtual worlds to manipulate objects or issue commands with gestures. "You need to be able to pick up a gun from a table, fire it, and throw it away without even thinking about it," Luckey said. "You can light explosives, pull robots limb from limb, punch garden gnomes... lots of cool experiences." Oculus promised hands-on demonstrations of titles promised at a major Electronic Entertainment Expo (E3) event next week in Los Angeles. "Virtual reality lets you step through that window; finally we can create worlds that feel real. 2016 is going to be an absolutely incredible year for gaming." 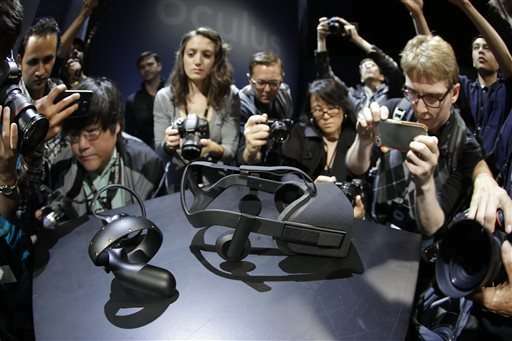 Oculus said the headset will hit the market in the first quarter of next year. 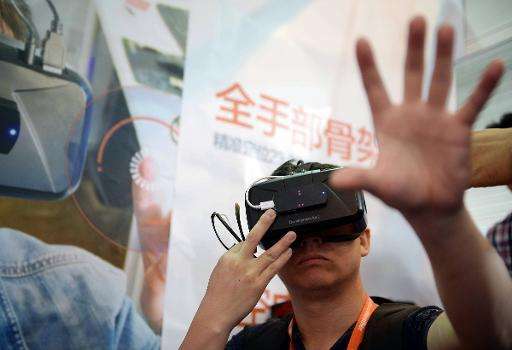 Early versions of the headset, designed for immersive gaming and other applications, have built a strong following among developers and has won praise from analysts for limiting the motion sickness which affects users of virtual reality (VR) gear. "Immersive technologies have a lot more to offer than video games, but it is a great place to start," said Gartner analyst Blau. Facebook last year bought Oculus for some $2 billion. Facebook co-founder and chief Mark Zuckerberg said earlier this year that the acquisition of Oculus was a long-term bet that making the social network's offerings more immersive would pay off in the future. He suggested that the virtual reality technology could be applied to various offerings of the world's biggest social network. Blau expected the virtual reality market to be fiercely competitive, with players including PlayStation 4 console maker Sony and its Morpheus gear Microsoft's augmented reality gear HoloLens, but believed Oculus would be among the survivors. "It's a great day for Oculus; it's a great day for Facebook, and, honestly, it is a great day for the virtual reality market," Blau said at the event.